In “Stour Valley and Dedham Church” Constable has painted the Vale of Dedham – a familiar and beloved area of his native England. In the foreground, men shovel compost from a dung heap. The landscape behind them is groomed – tidy and clean, in comparison with the random, blowsy growth on and around the dung. That the manure pile is tucked away from view – actually behind a separating hedge – is emphasized by the artist’s use of light and shadow. The untamed fecundity of the sprawling vine (front, center) that emerges from the manure is a contrast to the expanse of land tamed by man, which fills the middle ground. Seen in the distance is the church which, though quite small and slightly off-center, is the center of organization for the village, the surrounding fields, and even the workers, whose presence in the center-foreground points directly ‘upward’ in a straight line to it. The skyscape that fills the upper third of the canvas emphasizes the extent of man’s domains even as it seems to flatten and limit them – perhaps a suggestion that, for all his mastery of the things of earth, man is still dwarfed by Creation and its Creator. The tower of the church just barely ‘touches’ the sky at the center of the far horizon, and draws attention more to itself as a center of human activity than as a meeting place for man with the Divine. This reflects, perhaps, a bit of the English, Protestant ‘humility’ by which the form of ‘church’ was emptied of its sacramental power. Since both the dung area and the cleaner field-and-stream area are painted evenly – similar colors, balance in space and lighting, connected organically – the artist seems to sense the beauty of both areas, and to appreciate the dependence of the more ‘noble,’ or ‘glorious’ landscape on the humility of hummus, and human labor. The workers, though handling the lowest of elements, are dignified by their central, forward position, by the link to the church, whose Sabbath days crown their labors with rest, and by the beauty of the lands to which they make a vital contribution. The heavens look on the whole scene with a calm detachment that seems to place all that lies beneath into proper subordination and peaceful proportion. 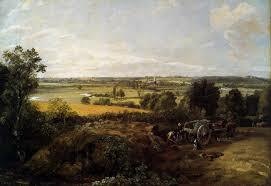 Constable has used diminishing size, faded color and decreasing detail to create the perspective of great distance. The size and sharp detail of the wagon in the foreground, if compared to the small, less sharp image of the church in the middle-ground, might suggest, in addition to spatial proportion, the proportion of six days labor to one of Sabbath worship and rest. This is certainly God’s created world, but man deserves credit for working it with the sweat of his brow. The flat gray of the sky, reflecting the green fields below, seems continuous with the landscape, rather than an overarching and distant, celestial heaven. The artist is clearly proud and fond of this view, and the men whose nobility is represented in it. His frank approval seems to echo God’s own pronouncement that what He sees here is good!